1. Preheat the oven to 160°C, gas mark 3. Put the rice in a pan, cover with water, bring to the boil over a medium-high heat and simmer for 18 minutes, then drain. Meanwhile, cut the tops off the tomatoes, then use a teaspoon to scoop out the insides into a jug, leaving the shells intact. Arrange the shells in a small/medium baking dish in which they sit snugly. 2. Fry the onion in 2 tbsp oil in a pan over a low-medium heat, stirring, for 5 minutes. Add the courgettes, turn the heat up slightly and cook for 5 minutes more. Add the garlic and tomato purée, cook for a minute, then stir in the reserved tomato pulp and the par-cooked rice. Simmer, stirring often, for a few minutes, until the mixture has the consistency of a loose risotto. Remove from the heat, stir in the herbs and season. 3. Spoon the rice mixture into the tomatoes, filling them generously. 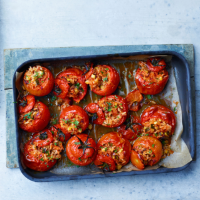 Replace the tomato tops, drizzle with the remaining 3 tbsp oil and bake for 1 hour, until very tender and the rice is cooked through. Serve with a green salad, if liked.